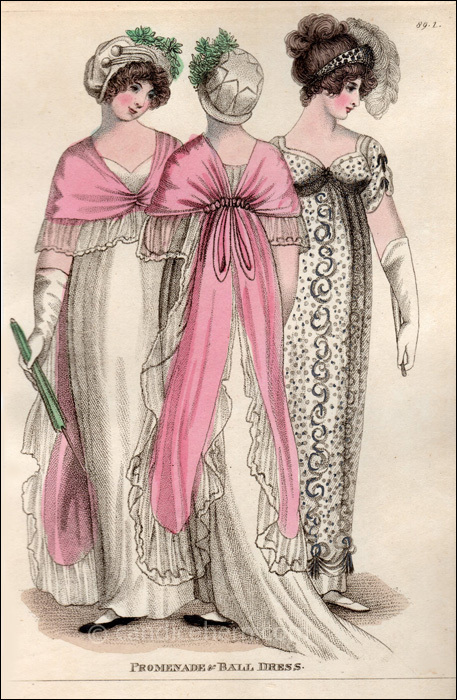 Fashions of London and Paris, June 1805. 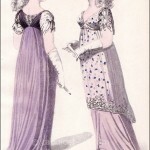 It is mentioned that the ball dress was worn at Frogmore. This estate, built in the 1680s, was purchased by George III in 1792 for the use of Queen Charlotte and their unmarried daughters. Though it was primarily a private retreat for the royal ladies, it was also the site of occasional balls and receptions. “Fig. 1.–A dress of white muslin, made plain over the bosom, with short sleeves; a cloak of apple-blossom silk, trimmed with deep white lace. A white satin hat trimmed with crape and ornamented with a green sprig in front. “Fig. 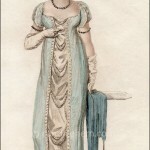 2.–A dress of plain muslin, with apple-blossom cloak, the same as the former, representing the manner it is worn behind. 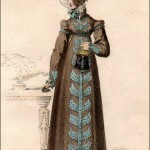 A hat of satin and crape, ornamented with a flower.